February is shaping up to be a busy month for me! I'll be giving talks in Utah, Connecticut and Maryland. There's also a scheduled talk in Florida in April, so if you're spending Passover in Florida, come on by! My talk at RootsTech will be livestreamed, so you can watch from wherever you are if you can't make it to Utah. 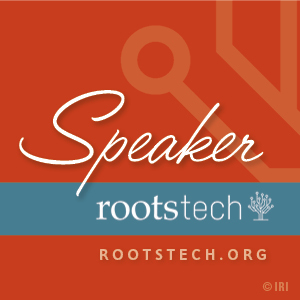 You can see the full list of RootsTech streamed sessions here. Last summer I wrote about how an old 1999 posting on JewishGen led me to Ron in Australia, my third cousin once removed. We've been corresponding, sharing family stories and photos. During the recent FamilyTreeDNA sale, I asked Ron if he would test, particularly since my great-great grandmother Itta Farkas Rutner is on his direct female line, making him one of only two known descendants with her mtDNA. 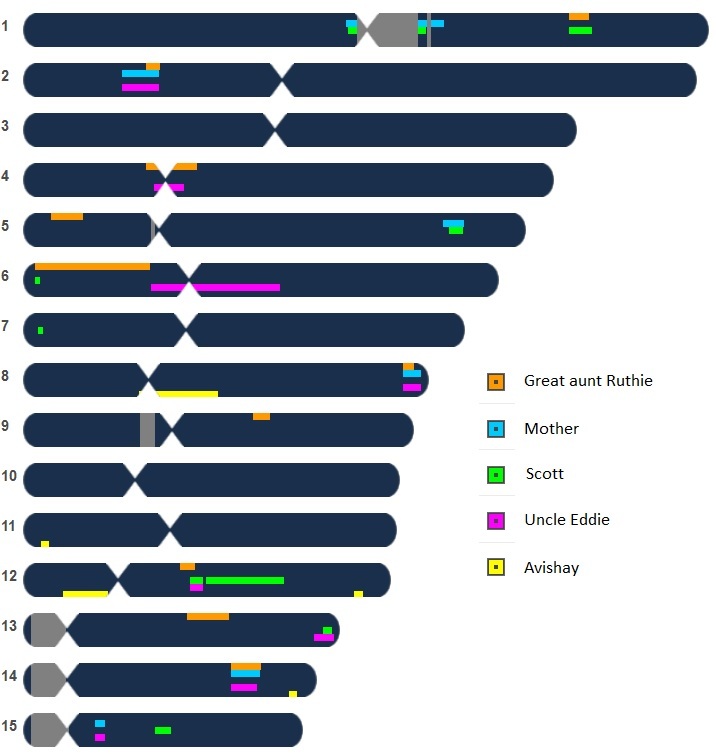 We tacked on a FamilyFinder to get a better look at Rutner autosomal DNA as well. Ron's FamilyFinder results just came in; his mtDNA results are still processing. And we've been able to narrow down quite a bit of Rutner DNA. My New 6th Cousin--Thanks to DNA! About nine months ago, I got an email from someone named Avishay who had just received his DNA results. One of his closest matches was my mother--and he noticed that I had listed Rutner as one of her ancestral surnames. 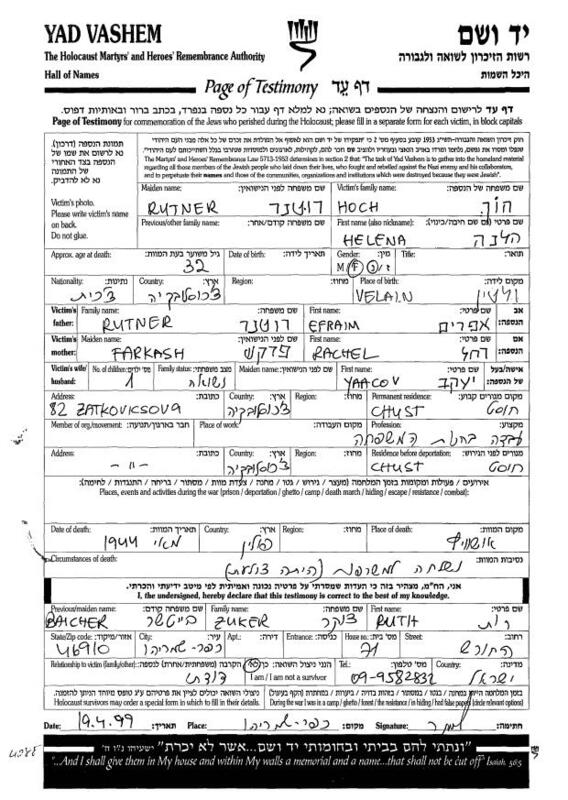 Rutner was also the maiden name of Avishay's mother. (Avishay shares 149cM with my mother, including segments of 25 and 14cM.) Her parents had both died when she was young, so she didn't know much about her parents--not even the names of her grandparents. She did know that her father was one of eleven siblings, but she only knew the names of three of them. Avishay told me his mother had been raised in Khust and that that his maternal grandfather's name was Avraham Rutner--and Avraham was quite a common name among my Rutners. Between this and the DNA, I figured if I looked into Avishay's family, perhaps they'd end up connecting to my own. 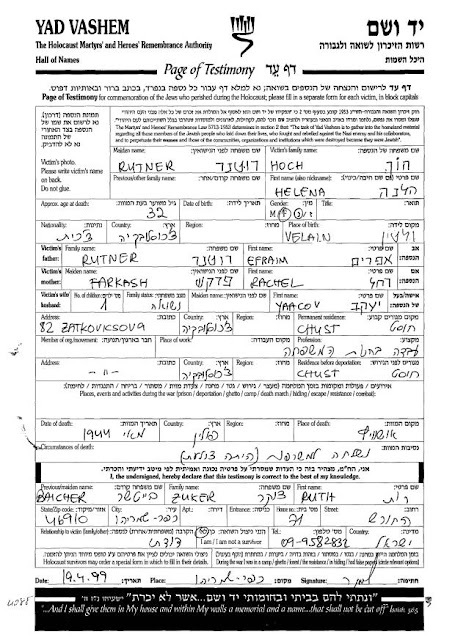 Avishay knew that one of his mother's aunts was named Henche, and she had married someone named Yanko Hoch. Last week, my aunt and uncle had a Chanukah party at their house. I asked my uncle (my mother's brother) if his mother had ever spoken about having aunts and uncles who were killed in the Holocaust, as my mother had never known that was the case. He said that he knew that there were relatives killed, but "maybe the family Bible says something." Family Bible?!? 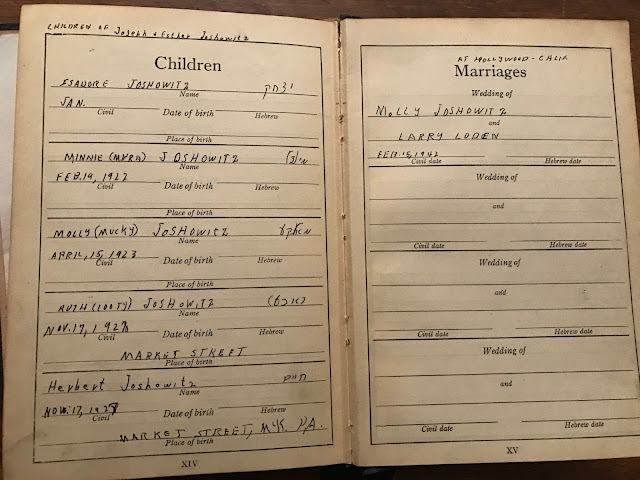 It turns out my grandmother's youngest brother Herbie received a Chumash (Bible) from the Gemilas Chesed Sisterhood for his Bar Mitzvah. And Uncle Herbie filled out some of the family information.